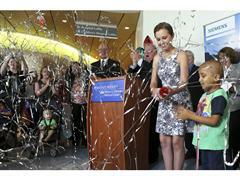 Sarah Park, a high school student and cancer survivor, celebrates the millionth pass of the Baton during the Siemens Baton Pass event at Hershey Children’s Hospital on Tuesday, Sept. 2, 2014 in Hershey, Pa. The Baton Pass™, benefiting Stand Up To Cancer®, is a campaign designed to raise funds for cancer research at a time when they are critically needed. Siemens is donating $1 to Stand Up To Cancer for every physical and virtual pass of the Baton, up to $1 million through September 5, 2014. Today’s event brought Siemens to its goal, and the company is fulfilling its pledge to donate $1 million to Stand Up To Cancer.